← Singapore fried rice noodles. I’m a recipe cook: I choose a recipe and follow it mostly to the letter. I rarely venture out without a recipe. There are a number of reasons why I stick to recipes. First, and probably most significantly, my Mom is also a recipe cook so that is how I learned to cook. I also think cooking from a recipe satisfies my engineering personality. I like all those precise measurements. Lastly, with so many good recipes out there, why not use them! Every once in a while I get inspired to try something “freestyle”. Usually something triggers my inspiration: a leftover ingredient, a bunch of veggies that need to get used up, or an idea that just sort of pops into my head. My most successful freestyle adventures are soups made in my slow cooker. This time, my inspiration was a package of grass-fed beef crosscut shanks in the freezer. I also had some celery in the refrigerator that needed a use. I pondered my soup for a week or so before I made it, thinking about what ingredients I should use and the techniques. This soup was my most successful freestyle to date! I am very glad I wrote it all down because I will certainly want to make it again some day. 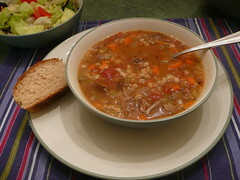 The barley was a great addition – I really like the texture it provides. My daughter ate with gusto, even using her bread to scoop the soup into her mouth. Preheat oven to 375°. Place crosscut shanks on a roasting pan and roast for 40 minutes, turning once after 2o minutes. Warm olive oil in a skillet over medium heat. Saute onions and celery until just tender, about 5 minutes. Scrape into a 4 to 6 quart slow cooker. Add carrots, tomatoes with their juices, bay leaf, garlic, parsley, thyme and barley to the slow cooker. Place the meat on top of the vegetables, scraping in any accumulated juices and browned bits. Pour in the beef broth and water. Cook on low heat until the meat is tender and falling off the bone, 7 to 9 hours. When the meat is tender, remove it and the bones from the slow cooker. Allow to cool slightly, then remove the meat from the bones and chop into bite-sized pieces. Make sure to get the marrow from the bones! Remove the bay leaf and parsley sprigs from the soup. Remove the garlic cloves if desired (or leave them in as a nice surprise for a garlic-lover in your family!). Return the meat to the slow cooker. Add salt and pepper to taste. Note: A pound of beef stew meat can be used in place of the crosscut shank. Instead of roasting the meat, brown it in a little olive oil in a skillet before adding it to the slow cooker.